Cherimoyas are fruits that are native to the mountains of Ecuador and Peru. They are somewhat heart-shaped with thin green skin. They resemble a closed pinecone. The pulp is creamy-white with large, black, almond-shaped seeds and has a delicious sweet, custard-like flavour when ripe. 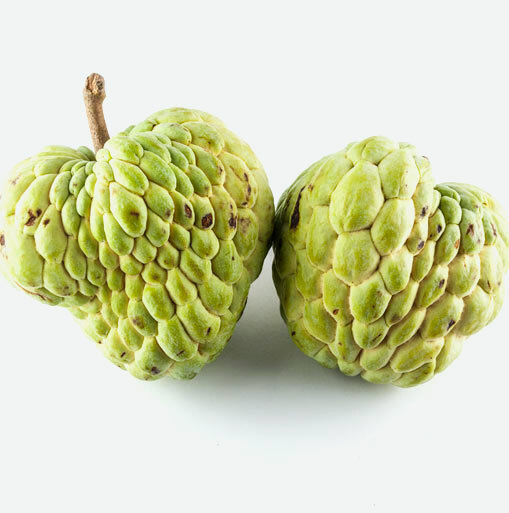 Cherimoyas are also known as “custard apples”. Cherimoyas are low in fat and sodium, high in fiber, provide iron and niacin, are cholesterol free and are absolutely delicious. The fiber is beneficial for maintaining regularity and these are great fruits for calorie conscious individuals. When you are buying cherimoyas, look for fruit that is firm, heavy for its size, and free of skin blemishes. Store cherimoyas at room temperature until they are ripe. When they are just right, they will give slightly with soft pressure, feeling much like an almost-ripe avocado. Once ripe, cherimoya can be refrigerated for up to four days, well wrapped in a paper towel. The pulp of the cherimoya is the only edible part, so remove the seeds and peel before eating. Halve the fruit and spoon the inside from the shell. Cherimoyas are best served well chilled. Try adding this delicious fruit to fruit salads, pureed and added to fruit drinks or use as a topping on ice cream or pudding. Another way to serve cherimoya is to peel, remove the seeds, slice and serve fresh. To ripen cherimoyas, simply set the fruits out on the counter at room temperature and they’re ripe when they yield to gentle pressure. Once these fruits are ripe, you can refrigerate them. Cherimoyas ripen much like bananas do. They go from a hard green colour to a pale yellowish green.